Military aircraft mechanics are fond of asking a trick question; "What is the primary purpose of an ejection seat?" The answer: to provide a place for the pilot to sit. The secondary purpose, hopefully never used, is to provide a fast, safe means of escape from a crippled aircraft. While cars don't have ejection seats, the car's seat is, never the less, a very important piece of safety equipment. Most drivers tend to think of the car seat in terms of comfort and appearance while ignoring the fact that the seat is a critical piece of safety equipment in a crash. The most common type of crash on America's roadways is the rear- end crash and the most common injuries drivers experience from that type of crash are whiplash and spinal injuries. The reason for this is simple. One of the laws of motion says "an object at rest wants to remain at rest." While sitting in a car seat, your body wants to remain at rest. If you are struck from behind by another vehicle, your body will want to remain at rest while the car is rapidly pushed out underneath it. If your seat isn't properly positioned, your body will snap back, followed by your head. This rapid snapping back of the spine and neck is what causes all the back injuries. Those of you who may have experienced this type of injury know that you don't really start to feel the muscles tense up and the associated pain until the next day. If it goes untreated, the trauma can cause long term and sometimes permanent injury. The seats position and its ability to remain upright in a crash, is so important that the Insurance Institute for Highway Safety (the folks with the crash test dummies) actually test the seat separately from the car. They remove the seat from the car, put it on the track and simulate a rear end crash to see how well the dummy fares in a crash. You can see how these tests are conducted at: http://www.iihs.org/ratings/head_restraints/head_restraint_info.html. You can also look up the seat's ratings for your particular vehicle. Too many people now days tend to place the reclining seat slightly back and drive in a slightly reclined position. While it may be relaxing, this is a very dangerous practice. 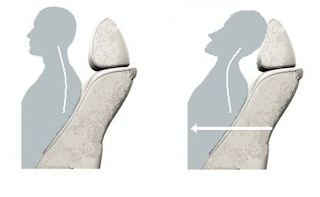 The further back the seat, the greater distance your body will be stretched backwards in a crash. To provide the greatest protection, your seat should be in the full upright position with the headrest just barely touching the back of your head. In this position, your body will be protected by the seat and prevented from snapping back so violently in a rear-end collision. The other advantage of placing the seat in a full upright position is to help keep you alert on long trips. Leaning the seat back may be more relaxing but it can be too relaxing, allowing you to become drowsy on long trips. To take full advantage of all the safety features in the vehicle, you should adjust the seat's position so that your body is a minimum of ten inches from the airbag. Your seat belt should be fastened with the lap belt low over your hips and the shoulder harness crossing the center of the chest and centered over the shoulder. Never drive with the shoulder harness behind you. If the shoulder harness doesn't fit properly, you can adjust the position where it attaches to the car's frame. If your car doesn’t have a shoulder harness adjustment mechanism, you can purchase a shoulder harness adjustment fitting for a very low price at your local auto parts store.